Von Erikson. Does he sleep? We don’t know. Perhaps he’s managed to do it in between moments of his tenure as a prop craftsman doing commercial work for places like Rediwhip and Absolut; maybe in the cracks of his schedule as a teacher at college; or perhaps he’s managed the skill of sleeping while playing upright bass for the Memphis Morticians. The man must have a secret. It’s Von Erikson’s work we’re proud to spotlight this time around. His Etsy store showcases some of the Von Erikson Lab’s best work in chokers, necklaces and bracelets. 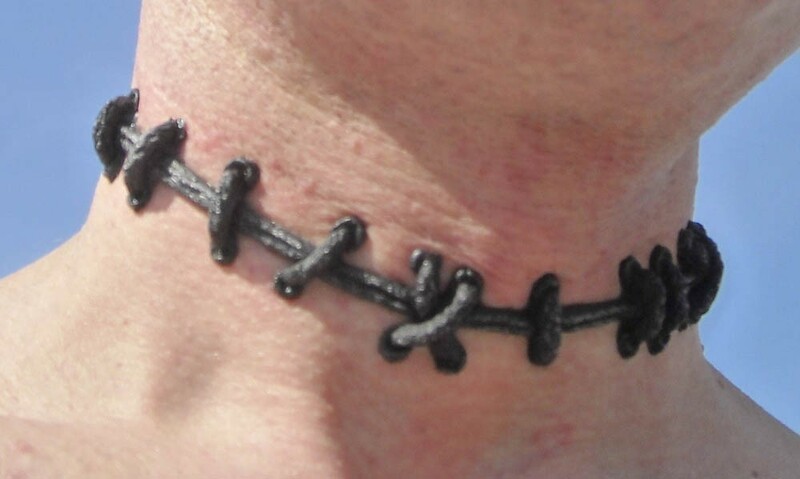 Want the authentic stitched together look but not too fond of needles or excessive bloodshed? Aren’t you glad we’re showcasing Von Erikson’s work, then? Take a look at the two chokers above. Rather realistic, yes? Or reasonably realistic. We’re sure if we saw someone leaving Ozzie’s Bar around closing time, we’d initially think the person was a dissatisfied customer, not happy with the burial job and thus come back to life to seek better services elsewhere. Then we’d wonder if Ozzie was slipping something into the drink again. Thus is the testament to Von Erikson’s work. We always like the Monster from Frankenstein. Seemed like a chap given a bad break, really. Brought back to life by some other person’s hubris. Granted, he was no angel, but who is? Of course, any undead critter from zombie to ghoul could be sporting this bracelet. Or someone with a functioning circulatory system could do their best in pretending. And we here would much rather you pretend to have stitches across your wrist than the real things. It’s not all stitches. As seen here, Von Erikson offers chokers and necklaces of the bloody type. Accent any evening wear or casual get-up with this necklace. If stitches are the ‘After,’ show the ‘Before’ with this necklace. It seems a bit gorey but maybe you’re looking to attract someone who’s into it. Or maybe you want to ward off vampires who think that your blood already sparkles. Or perhaps you just like this and want to wear it to dinner because you like it. We don’t mind. It’s a nice necklace, isn’t it? All of Von Erickson’s pieces are wonderful and we want you each to buy two, but the Cemetery Tombstone Necklace is one that hits close to our hearts, which is not to say our hearts are not close to our necks (we hope.) This also glows in the dark, which we’ve only seen happen once before in real life so we can say that Von Erikson has captured an authentic cemetery experience that you can carry around just about anywhere. Kind of taking a little bit of home on the road, outside of taking a pocket of dirt or a shovel in the back of the car, which is already pretty much a given anyway with us. Speaking of which, the band that Von Erickson plays, the Memphis Morticians, can be found here, with their Myspace here and Twitter account here. Von Erickson has the scoop, saying the Morticians are almost done recording the new album entitled “Bereave it or not, Another record by the Memphis Morticians” and it will be available soon on some non-major label. Get hip. Get crackin’. Get back here next Tuesday for another Tuesday uEtsy.